Home » Blog » It Was Never Going to Be About the Sparring….. It Was Never Going to Be About the Sparring….. When I started jiu jitsu, I saw women’s cross training as a way to get better at competition (our bodies have a different center of gravity than guys, other women are less likely to “take it easy” on another woman, someone in the same weight class, etc). I didn’t go to seek much other than getting better at my own game. While this mindset wasn’t negative in and of itself, it was limiting. I had not understood the full gravity of what it would ultimately bring to my life in other ways. Let’s face it. When we train jiu jitsu, and you are in it for awhile, you stop getting invited to do girl’s night during the week by your non-jiu jitsu friends. They get that you’ll always go to practice, and that even some (aka most) weekends will be dedicated to some type of travel, event, or the need to sleep for 15 hours straight after a complex training week. So for much of the time, the people in our academies, love them or hate them, become a bit of a quasi-family. With all different personalities and walks of life tossed in together like one spicy salad served up multiple days per week. 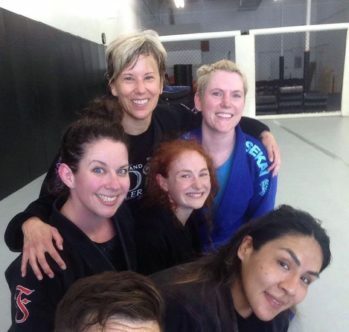 I’m lucky enough to never be the only woman on the mat at my academy, but some nights it will just be me and one other (her nickname is Killer and I love her dearly), or others have the joy of seeing seven female students from teens to women sharing that space. Guys are great, don’t get me wrong… but there are many things that they’ll never have to face, such as being excited when the women almost outnumber the men for one or two training sessions a year. Almost. So enter the women’s community. Myself as well as a few of the other decision-making women of all belt levels in my local metro area decided to train together regularly. At first it started out to roll with each other, as we didn’t know each other any better than facing one another in a tournament bracket or as a spectator rooting for the other team. We took turns hosting open mats, warming up together, and doing some live training. We didn’t make it much more than that. And over the last year and a half of seeing each other at least monthly, and some ladies every week, we’ve learned quite a bit about who we are individually as well as our commonalities as women in this male dominated sport. Like that many of us share leadership roles at our academy and feel that pain when a same belt male is given the full class while we are given the women’s and kids class to teach. Or that we feel our egos flaring when we face a newer man bigger than us that we should be beating, but struggling for whatever reason, and feel like it takes away from our level. Or knowing that we are smaller, we are aging, and it’s just going to get harder to handle the big man body-builder types. Or wanting to be a strong competitor but knowing that family and life commitments really only support a few nights per week. Or being the highest ranked belt on the mat and still experiencing mansplaining. Or seeing that every single red and black belt is male, as well as at least 95% of all academy owner that we can think of happens to be a guy. And after hearing this from another, we can start to recognize where this comes up in ourselves, that knowing it might just be a little tougher as a female, and that we are doing things about it. That we aren’t going to just sit back and accept our positions, but know that we truly do have “Strength in Solidarity.” That we can walk confidently in our academies knowing we weren’t the only one who had the thought, and to make small strides each day to be aware of the challenges of the female practitioner. To know others understand what we are thinking and we aren’t carrying it by ourselves. To work to be the force in our schools for equality, and to be able to come back together as a local women’s community to check in, share what is working, and continue to go out there and build. To have a safe space where we can work hard with each other, try out nuances of our game that all of our training partners currently see coming for the 100th time (or are so outside of our weight class that it would work entirely differently on someone 50 pounds lighter). To be able to ask each other how they stopped my attack, for them to answer honestly, to force them to grow from that space into the next level rather than being scared that we may “figure each other out.” To travel together to far-off open mats and competitions in a way that is freeing and empowering. To hear about how a gi they just bought fit, and then a whole bunch of us getting that same comfortable Fuji Sekai. To be that space for the women who are the only female in their academy, so they know what it is like to have other female training partners until they can start to have a few of their own. To have women who understand why we do what we do, that don’t beg us to miss practice to spend time, and are funny and awesome to hang out with. Having deep conversations stretching out before training or after sweaty rolls giving each other our best. To know that we are all there for no other reason than to spend time making ourselves better inside and out, in the presence of each other. And I thought we were just getting together to choke each other out. Little did I know that you would all change my life in more ways than I could ever imagine. Tamara Leonard is a purple belt with Adventure Martial Arts training center out of Parma, Ohio. Tamara has been training jiu jitsu since May 2010. Tamara also holds a black belt in kenpo karate as well as is a certified IKI Krav Maga instructor. Currently she works as a school psychologist as a consultant; as well as fitness instructor, Precision Nutrition coach, certified wellness coach, and program manager at Adventure Martial Arts. Tamara’s hobbies include travel (that always happens to involve jiu jitsu), music, outdoor adventures, and hanging with her amazing pets.